Anyplace Control is a multifunctional utility for remote PC monitoring and administration. After the software is installed and deployed, it allows you to view the desktops of other users on the network and remotely access computers to launch programs, transfer files, shut down or reboot, fix technical problems or completely take control over a remote PC. Download it for free and make sure that remote control is really easy. Please contact us with the contact form to report difficulties, strange behaviors or persistent problems, and quote the program name or the number 4188 . This is the download page for Anyplace Control - Anyplace Control - fast, affordable remote PC control and monitoring software for individuals and businesses. The idea behind the program is quite simple - installing the software allows a person view the monitors of other users in the network and remotely access their computers to launch programs, shutdown or reboot computer or fix technical problems. All this can be done from the office, at home, hotel, well- anywhere. Software includes: File Transfer between PCs; Cut and Paste between PCs; restart and shutdown remote pc, lock remote mouse and keyboard, turn off remote monitor etc. It works with dynamical IP addresses and bypasses routers and firewalls without any network settings. Anyplace Control features reliable secure multiple connections support that won't overburden your network. The connection and data transfer speeds are very impressive. 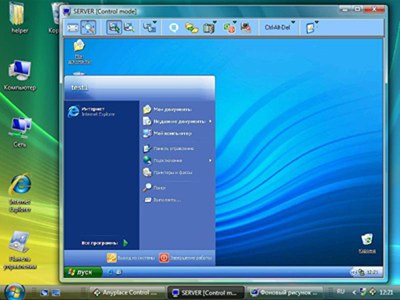 Importantly, with the split-screen technology one system administrator can monitor multiple computers, as well as two or more administrators can control one remote computer at the same time.